"Apart from the mic, the mic pre is the most important link in the chain, and the P-SOLO makes professional sound affordable. 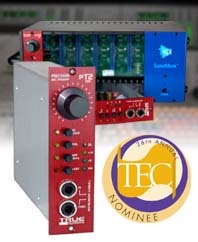 To my knowledge, it is the least expensive high-end preamp you can get and makes a big difference in the sound of any microphone." "The P-SOLO Ribbon, which comes in at well under $700.00, is performing at a level that's comparable to mic pres that cost five times as much. That makes it an excellent candidate for studios or musicians that use ribbons and can't afford to have a lot of preamps. The value-for-money of the P-SOLO Ribbon is unrivaled!" "The sound quality of the TRUE Systems Precision 8 was excellent, especially in conjunction with the Schoeps microphones. They were clean, crisp, and pristine in the 2kHz to 10kHz range and captured the ambience and vibe of the Carnival Center beautifully." "The TRUE Systems Precision 8s and Microtechs are the perfect partners. We've had countless unsolicited praise about the clarity and beauty of the sound on previous projects from people who don't think much about audio. It's that obvious." • New DI circuit calms edgy piezos. • DI THRU jack for amping or effects. • Ultra low-noise. AMAZING sonics.